Thinking about hiring a senior caregiver? Here’s how to get your elderly loved one on board. Too many adult children wait until they’re overwhelmed before seeking outside help. If you wait until you have a crisis, the situation is much more likely to cause hurt feelings. Planned in advance, you can introduce the use of caregivers as a positive element in an aging person’s life. 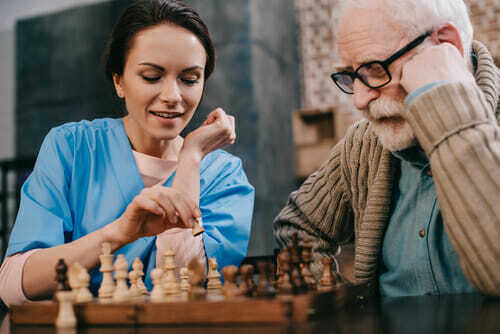 Some people hear the phrase “in-home care” and assume you’re talking about full-on 24-hour nursing services, with a stranger taking up roost in your home. Who wouldn’t resist that? It helps to explain all the different ways caregivers can help you and ease your way into more services over time. When it comes to handling sensitive care issues, timing really is everything. Don’t wait until you’re in the middle of a blow-out to announce your thoughts on home care. Whether or not it’s been on your mind for a while, the setting can make it feel more like a threat. Your goal is to help your elderly parent see a caregiver as a benefit, not a consequence. Seniors struggle enough with the losses that come with getting older. They don’t see or hear as well, balancing well enough to walk can be hard, remember things, speaking clearly, simply moving uninhibited can be a challenge. It’s not on purpose, so find the right setting and the right timing to discuss it with your parent. Wait until things are peaceful between you and your parent to raise the topic. Start with a job around the house a helper could assist with, from cooking to sorting out pills. Explain what a short time it would take someone to get the job done. Then be direct about your desire to bring in outside help. Too many children beat around the bush and wait for their parents to ask for outside care. To be honest, it’s not always an option seniors consider. Their minds jump from living at home unencumbered or getting help from a relative to living in a nursing home. They completely forget about – or sometimes, simply don’t know about – in-home caregiving services. If the concept seems new to them, compare it to hiring someone to clean the house or mow the lawn. Both are regularly hired out because the time and effort they save is more valuable when spent on other things. Arguments over whether to bring in a caregiver don’t have to get cut-throat. It’s imperative for you to respect your elderly parent as an autonomous person with the right to make his or her own decisions. That’s different from having to do whatever they want. You can – and should – explain when you don’t have time to get them ready in the morning or late at night. Point out what you’re not doing anymore and lay out their options. It is up to your parent whether they hire someone or go back to handling these tasks themselves. There’s a saying in the industry, “waiting for the big fall.” Sometimes, sadly, it takes a serious injury for someone to admit there’s a need for professional help. Legally, there isn’t much you can do to force it. Listen to their concerns and work together to find solutions. As seniors lose some of the strength, dexterity and overall security of their youth, fear takes on new importance in their lives. It’s never just about them. They worry about strangers in their homes, of course, but they also worry about what will happen to their children and grandchildren should things really go south. You can’t appreciate those fears and address them effectively unless you are really listening. Enter the conversation knowing you aren’t aware of everything affecting your parent’s quality of life. Be willing to listen and take their thoughts seriously. Be prepared to hear worries that have never crossed your mind. For instance, the family might be nervous about having a stranger roaming around the parent’s home where other family members can’t watch them. Instead of brushing off legitimate concerns, it’s important for you to address them head-on if you want your parent to feel safe. Enlist the help of professionals your parent trusts. Sometimes there is nothing anyone in the family can tell a senior. In those situations, it might be possible to talk with a doctor, lawyer or other trusted family advisor. The opinion of a seeming authority figure could make all the difference. If you’re interested in hiring a senior caregiver, Celestial Care can help answer your questions and find solutions to your loved one’s concerns. Contact us for a private consultation today.